Add just enough mayonnaise to hold it together. 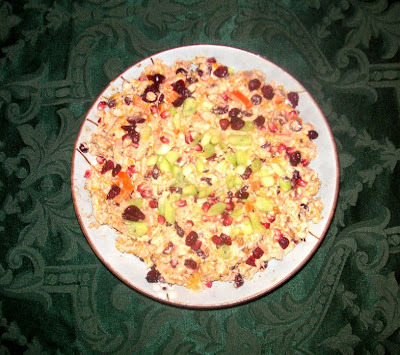 (I used about two heaping tablespoons for about 8 cups of chicken salad. I thought the scallions were really necessary, but didn't mix them in the salad. As garnish, those who don't like scallions can take from the sides. With a utility knife, cut through the skin from top to bottom and use your thumbs to pull segments apart. Aim for 3-4 segments total. 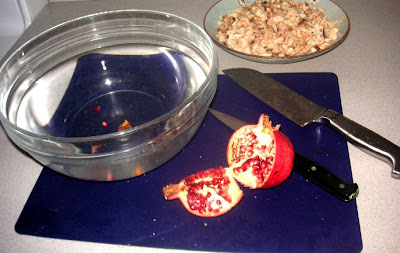 Place the segments in a large bowl of water. 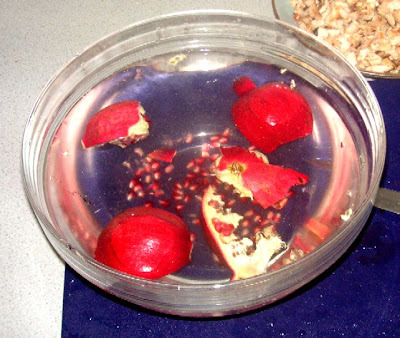 The loose seeds will fall to the bottom, while the inedible sections float. Underwater, gently coax the seeds from the yellow inedible foamy parts (What is the correct term for this part?) with your thumbs. Skim off the the foamy stuff with a strainer. 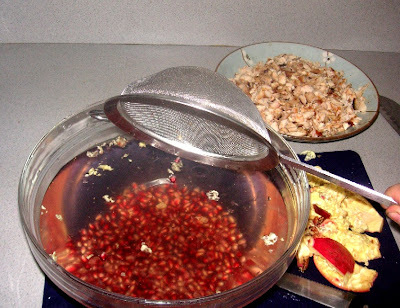 Clean out the strainer, and use it to retrieve the pomegranate seeds. That method is a lot easier and less messy than mine! Btw, for anyone who's interested, many people have the custom to avoid eating walnuts (and even other nuts sometimes) on Rosh HaShana because the numerical value of the hebrew word for walnut (egoz) equals the numerical value of the word for sin (chet). The gematria for nut (egoz) is 17. The gematria for life (chai) is 18. You're probably confused by the fact that the gematria for sin (chet) is also 18. You have to leave off the aleph to make the connection to egoz work. This is one reason why I think the custom of avoiding nuts is kind of silly (but it's respectable that you want to keep it). A friend of mine says that his rabbi once sent out a message about how people avoid nuts because of the numerical equivalence of egoz and chet and concluded, "so I think people should be very careful to avoid chataim (sins)." The gematria for "tov" (good) is also 17. Also, people used to hand out nuts to children on holidays as a treat. Hmmm. I wonder how that would go over these days, with all the nut allergies! Our elementary school just switched over to a "nut free school zone", forbidding nuts or anything that was produced in a facility that works with nuts from the entire campus - year-round.